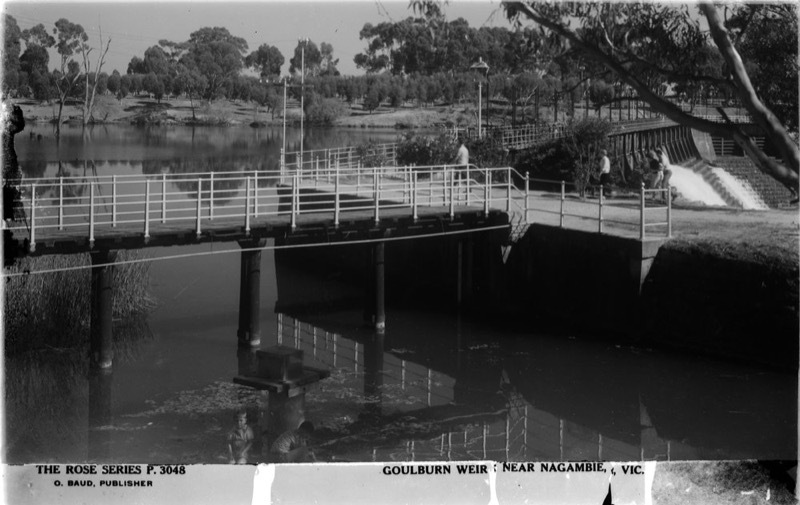 For the nineteenth consecutive time the committee of tho Goulburn Weir Sports Club have commenced the opening of the New Year by the holding of their annual sports gathering, which has now reached something of a big order, and the outing is looked forward to by holiday makers from the numerous surrounding centres, the metropolis and various parts of the State. 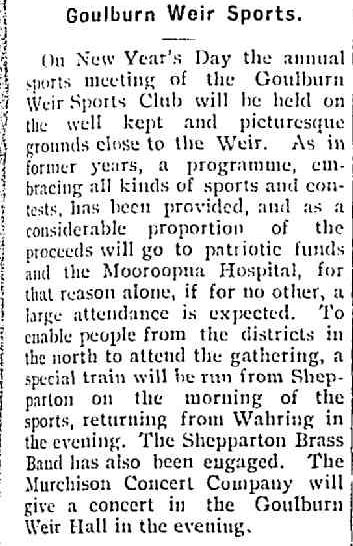 In fact many would look upon it as an ill omen should anything prevent them from spending the opening day of the New Year at the Weir. 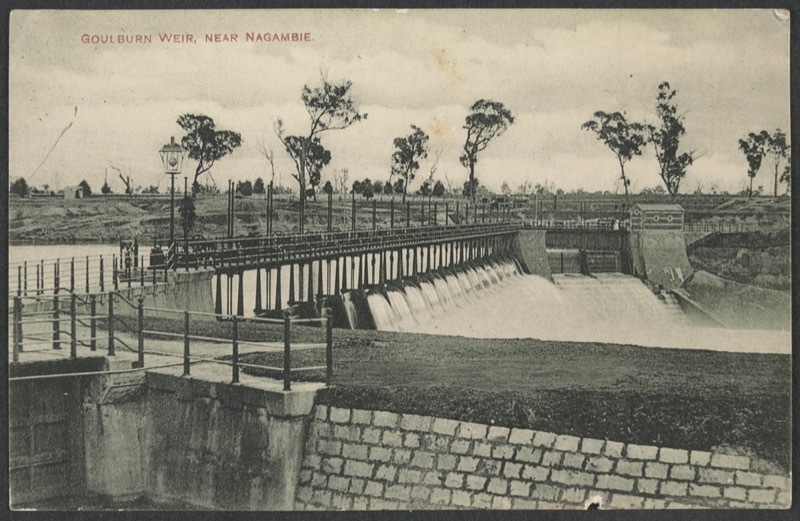 Delightful weather greeted the opening of 1914, consequently the attendance was highly gratifying to tho committee, the gate takings amounting to £87, whilst in addition to this close on 400 excursionists travelled by special train from whom tho Railway Department collect the admission fee of 1/-. It is estimated that the amount to be derived from this source will bring the total receipts up to £106, so it will be seen from a glance that the attendance was considerably over two thousand people. As time moves so to does the attractiveness of the sports ground increase, with its garden scenes and shady gums, of which, the public now reap the benefit of the inviting shade, and still view the happenings of either of the sports arenas in comfort and in ease. Since the last gathering of 1913, we also find erected a very comfortable publican's booth, a great improvement on the old system, but still hardly spacious enough to meet the large demand made upon it. This is only a minor detail, however, and the enterprise of the CIub's officials, as demonstrated in the past, will not allow them to hesitate in having tho necessary accommodation added prior to their next outing. In passing we also noticed that the committee made a wise move in utilising the hall for the luncheon. It proved a great success, and was most capably managed by the caterer, Mr Raeburn, and his staff. There was no waiting, and the rapidity with which the numerous patrons as they sat to table were served with a good, sub- stantial meal, showed that the organisation was not wanting in any way. Everything worked quietly and smoothly, and it was one of the features that certainly must have had a pleasing effect upon tho many patrons of the luncheon booth. A stroll into the seat of war, the secretary's office, and there we meet the popular and enthusiastic president, Mr Harold Gregory, together with the two veterans, Messrs R. Miller and W.J. Day, hon secretaries up to their eyes in business preparing for the fray, and no doubt this trio had put in a most anxious day, besides working hard long before the time to attain the desired end, and at the close of the day's proceedings it must be gratifying to them to find that success had crowned their efforts. And no doubt tho success of the gathering was justly due to them, together with the co-operation of their fellow officers. In the main arena -- cycling, pedestrian, bushmen and other athletic events we find the same old familiar faces, but with one absentee, the old and enthusiastic worker, the late Mr Donald McLeod, whose memory with the founders of the Club will ever remain green. Messrs Parris sen., and T. Donovan, as judges had no easy task set them, as many of the contests were remarkably close, but their experienced eye caught the right man on each occasion. Mr Andy Miller, as starter, must be complimented on the manner in which he got his fields away in each event. Mt Alf Salas again acted as timekeeper, Mr Hillard officiated at the blackboard, whilst no man worked harder on the day than Mr Jas Miller, who acted as organiser of the post entry events, besides taking a keen interest in the beautification and improvement of the grounds throughout the whole of the year. Another energetic worker on the day was Mr Jas Rowe, who, each year is seen at his post. Other good workers were Messrs A Robinson, T Derum, A and J Day, H Parris, Cameron Bros., G Sumner and many others. 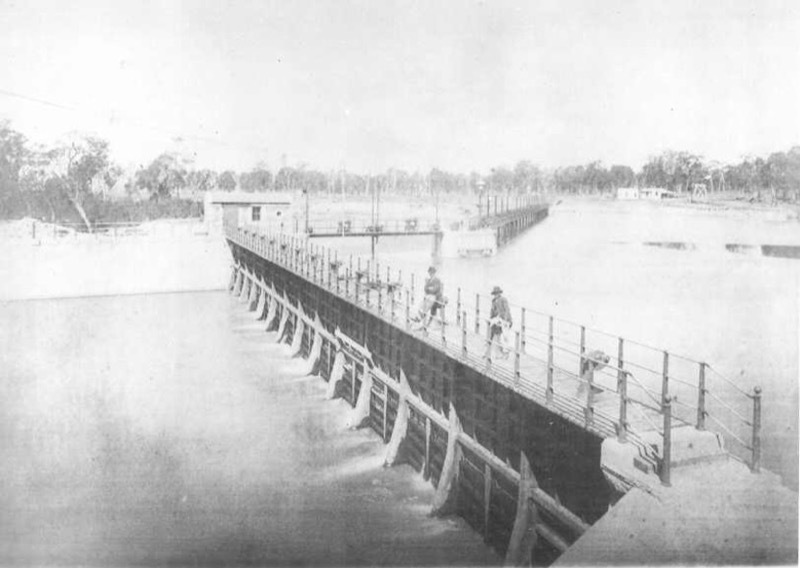 The proceedings were considerably enlivened by the Shepparton Brass Band, who were led by Drum-major Bailey, and the blood of those who possess a tinge of Scotch trickling through their veins was roused to a pitch of enthusiasm by two highland pipers who played selections during the afternoon. 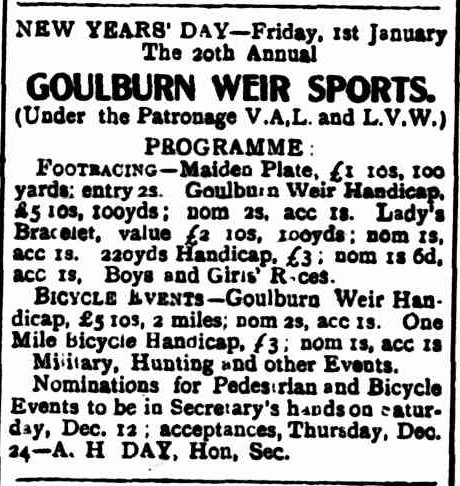 In the pedestrian events Brown (Kyabram) put up the unique record of winning a treble, whilst the bicycle races were won by metropolitan riders. The bushmen's contests were, as usual, eagerly watched, whilst the military and horse events formed quite a centre of attraction. 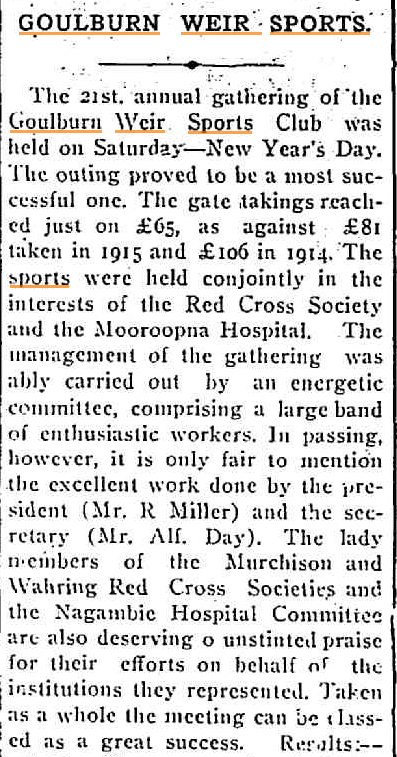 The 1914 gathering was a great success, and the popular president, and untiring and enterprising hon secretaries together together with their band of officers, are to be complimented on their achievement.